The reason I bring this up is because I won something because of them! 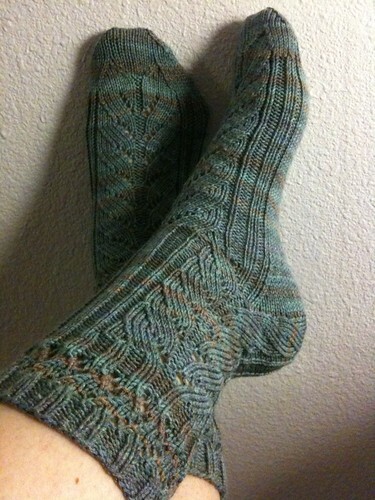 I won a copy of another sock pattern from the designer of these socks. I know it is not a big prize, but still, I won! A few weeks ago, J and I and our friends Sonia and Amy decided to go on a fall excursion. We drove out together to visit a few orchards and a pumpkin patch. We stopped in town to get some morning refreshments at local coffee shop before we headed out for the day. 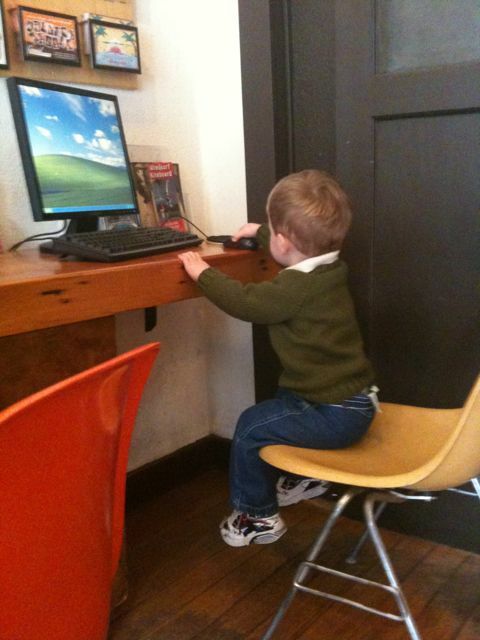 J decided to check his email. Of course, being so on top of things, I didn’t get any pictures of most of the rest of the day, including a pumpkin patch, an orchard, and an alpaca farm (yarn, woo!). 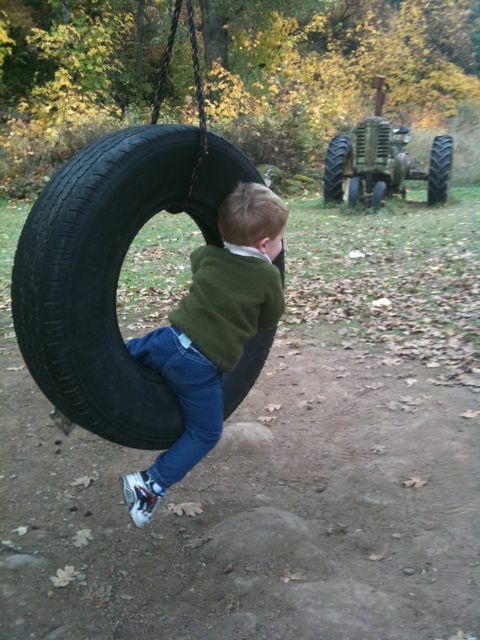 But, when we stopped for some roadside BBQ (yum) I did manage to get some pictures of J swinging on the tire swing there. He loved it! I know he doesn’t look happy in this picture, but I promise he liked it. 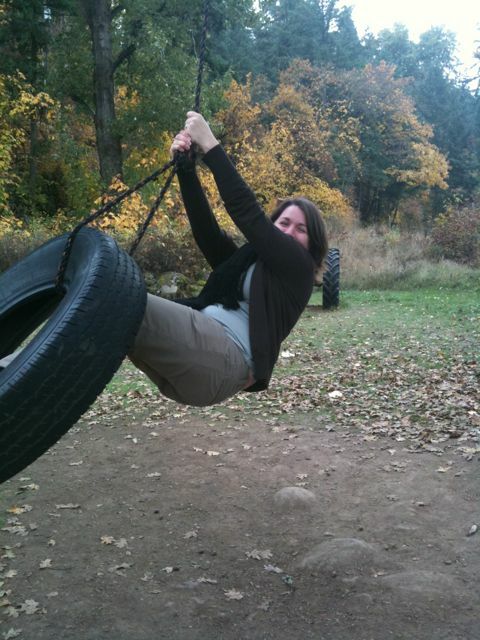 Either that or I enjoy toddler torture via tire swing. You decide. After J was done, I convinced Amy to take a ride too! Oh, the green sweater J is wearing in these pictures is the one I was plotting to make him back here. Go to Ravelry if you want the juicy details. In the works for knitting are a couple of sweaters for Jaxon for this Fall and Winter. I just ordered the yarn and am getting pretty anxious to get started! I am going to be knitting this basic V-neck sweater for him from Pure and Simple Knitting. The yarn I ordered is Knit Picks Swish DK in Moss (Green) and Persimmon Heather (Dark Orange). I just want to get started NOW. 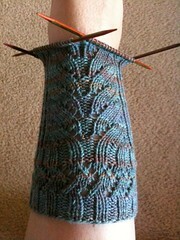 Come faster yarn, come faster! Oh, what to say about this… I think the title says it all. Mom gave me this yarn (as cast off from a project she is working on for J) and it was just so ugly and crazy and gross and clown-puke-like, I just had to make something with it. I didn’t want to commit to much, so I thought a vest would be perfect. It is too wide, too short, and scary it is so ugly. I didn’t expect anything else! The only way J will ever wear this again is if they announce a Clash Day at daycare. 🙂 Even though it is terrible, I giggled the whole time I was knitting it, and am so glad I did! The knitting on this one went fairly quickly. It only took me over 3 months to finish it because I avoided seaming this thing up. Well, that was silly. Took me about 20 minutes, following the Yarn Harlot’s method. It was simple. I really like the buttons I got for it. I also like the orange thread I used to sew the buttons on. It all works I think. I don’t have a baby in mind for this sweater. I just knit it because it is one of those things a knitter has to make. Anyone need a knitterly famous baby sweater? My first pair of socks. And they fit! I love the stripes. 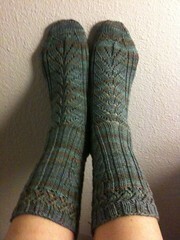 It is true what they say about hand knitted socks, they are magical. So comfy and warm! 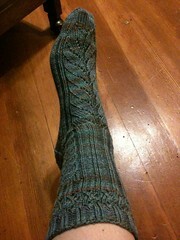 I ended up having to add in calf shaping since there was so much yarn, they got so tall! I am going to start another pair soon. I need a collection now! 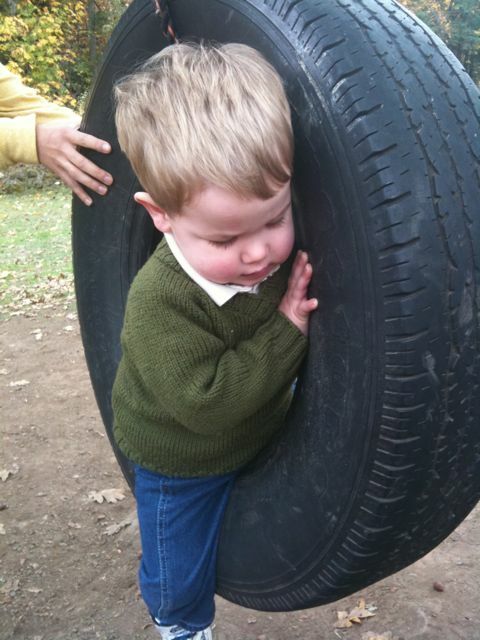 Jaxon and I have something else in common. We both enjoy a good dose of knitting humor. Maybe he would like to read the blog with me too?